Henry Holt and Co. (BYR), 9781627796439, 48pp. 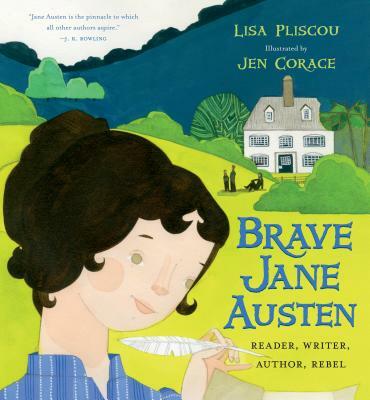 Brave Jane Austen, a picture book biography of the groundbreaking female novelist. Perfect for Women's History Month. Born in the late 1700s, Jane Austen was a smart, creative girl in a house full of boys, all of whom could aspire to accomplish many things as adults while girls were raised primarily to become good wives. Jane didn’t have much opportunity to go to school but she read everything she could, including all the books in her father’s study. And before long, she began to write her own stories, filled with funny, clever, and inventive characters. Today, Austen’s novels (Pride and Prejudice, Sense and Sensibility, Emma . . .) are widely read by all ages. She is recognized as one of the most important and influential writers of all time. Lisa Pliscou is the author of Young Jane Austen: Becoming a Writer and Higher Education, which David Foster Wallace praised as "an authorial coup." She lives in Washington with her family. Jen Corace is the award-winning illustrator of many books for young readers, including Telephone by Mac Barnett and the Little Pea series by Amy Krouse Rosenthal. She lives in Providence, Rhode Island.